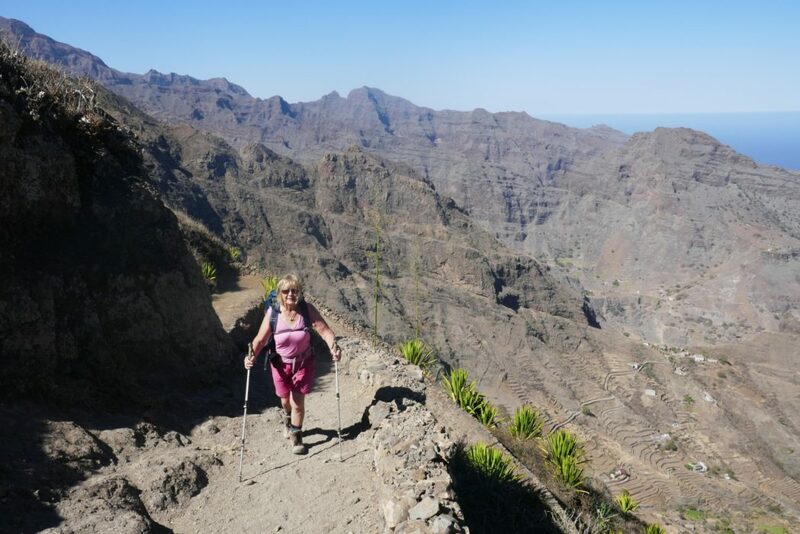 Sitting in the Atlantic, 600km from the west African coast, the 10 islands that make up the tiny country of Cape Verde offer an interesting variety of options for walkers. Mike Wells spent two weeks visiting six of these islands, walking up volcanic craters, along dizzying coastal paths, through deep gorges and across sandy deserts. The Cape Verde islands are the tops of volcanic outcrops in the Atlantic Ocean. Over millions of years, as the African tectonic plate has drifted north-east, a hot-spot beneath the Earth’s mantle has erupted periodically causing a series of volcanic peaks to rise from the ocean floor. 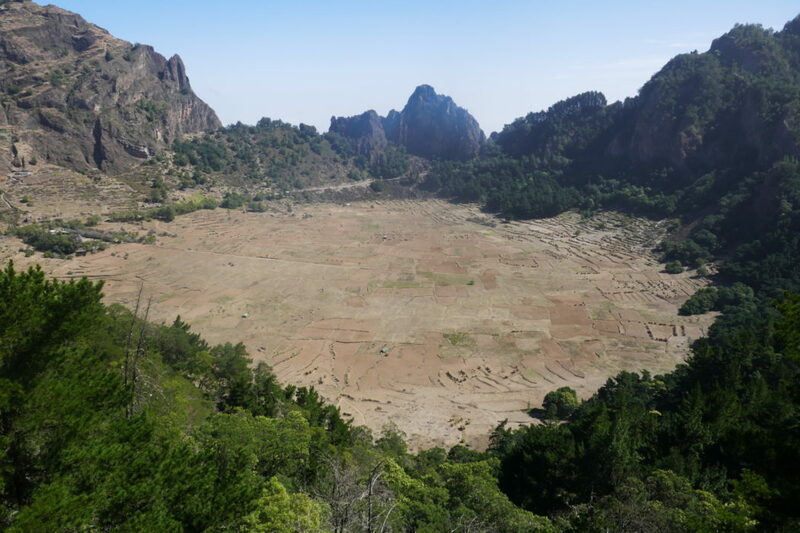 The oldest of these (Sal, Boavista and Miao islands) have weathered to be nearly flat desert islands with scattered low volcanic plugs rising above the surface, while the youngest, Fogo, is an active volcano that last erupted in 2014. The other islands all show signs of their volcanic past with collapsed caldera and deep gorges between lava tongues. Meteorologically, the archipelago is within the band of the north-east trade winds, which bring a dry season between January and June and a wetter season from July to December, although this sometimes fails to bring much rain. The cooling effect of the breeze moderates the temperature, with a monthly average of between 24ºC (January) and 30ºC (September), which is pleasant for a location only 15–18 degrees north of the equator. Discovered by Portuguese navigators in 1455, Cape Verde was a Portuguese colony until independence in 1975. For over 300 years the principal island, Santiago, was used as a base for the slave trade between west Africa and the Americas, while the desert-like island of Sal produced salt for use in Portugal’s African colonies. 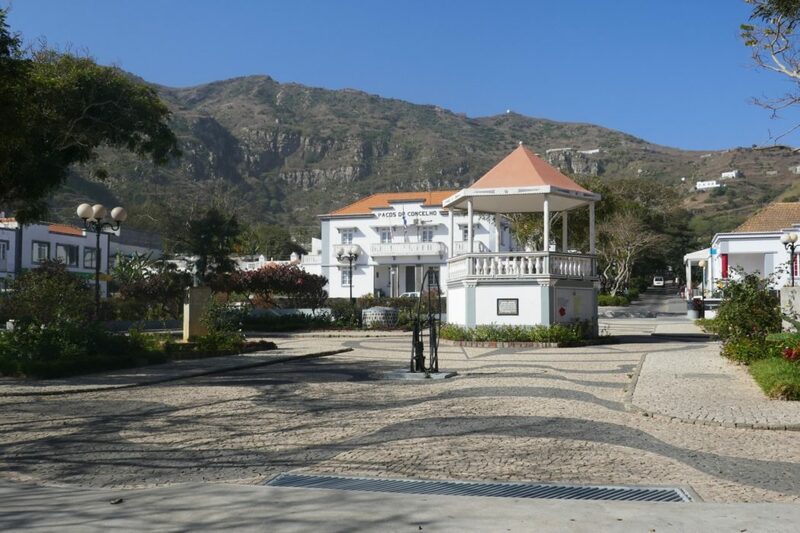 Later, in the 18–19th centuries, Mindelo on São Vicente island became a British re-supply and coaling station for Royal Navy and merchant ships en route to India via the Cape of Good Hope. 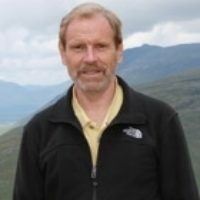 The differing geological environments provide a fascinating variety of walking conditions. Sal island is a rolling desert wasteland of crusted sand and rock. At its southern tip, international hotel and travel companies have built a few all-inclusive resort hotels hoping to attract sun, sea and sand holidaymakers from northern Europe. Fortunately, the rest of the island is barely affected by these developments, save for minibus loads of tourists on round-the-island tours and hedonistic thrill seekers criss-crossing the sandy wasteland on rented quad-bikes, their progress marked by moving clouds of dust. We walked across the desert to visit an ancient salina, where salt was extracted for use in Portuguese colonies. Enclosed entirely by the low caldera walls of an extinct volcano, sea water percolates magically through hidden holes in the rock to appear within the crater. 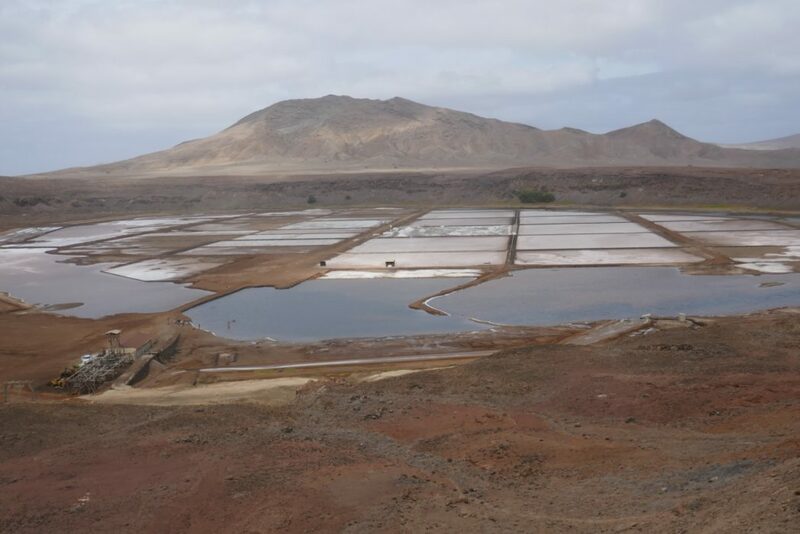 For centuries this has been channelled into man-made salt pans where it evaporates to leave light grey-coloured salt. A few locals toil, digging out this salt, but standards do not meet modern international hygiene requirements and it is no longer exported. The un-evaporated water left in the pans is highly saline, and swimming is allowed (or rather floating, it being difficult to get sufficiently below the surface to swim). Walking in another direction we reached the ‘Blue Eye’. Here, part of a subsurface lava-tube that emerges in the ocean below rocky cliffs has collapsed to leave a deep pool of blue water. 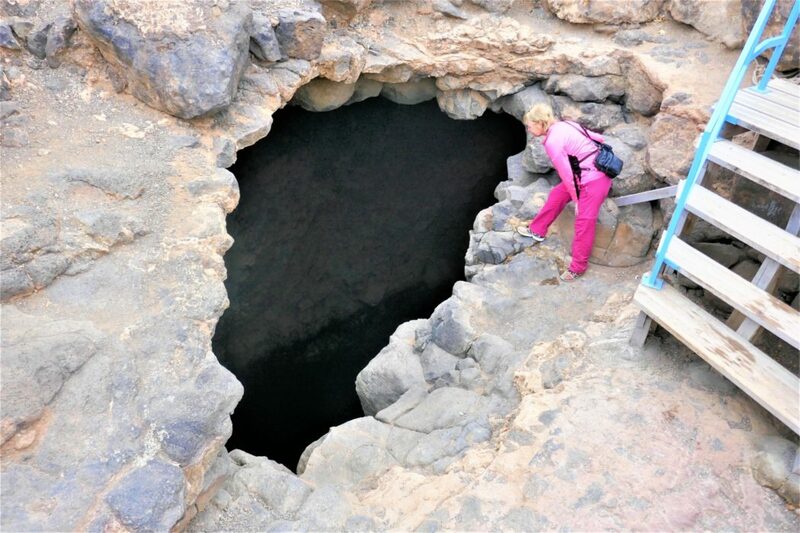 This can be entered from the sea by scuba divers, who then startle tourists looking into the deep hole by surfacing 50m inland. Unfortunately, when we visited it was a cloudy day and not blue, and there were no divers as the sea conditions were rough. But, hey-ho, perhaps another day. The volcano island of Fogo rises nearly 3000m, straight from the ocean. An enormous eruption a few hundred thousand years ago created a crater 10km across with a rim 3500m above the Atlantic. Within the past 10,000 years, part of the walls crashed into the sea, leaving a C-shaped caldera. Between the 15th and 18th centuries, a series of eruptions replaced the missing part of the rim with a new volcanic cone that by 1785 rose 1200m from the floor of the old caldera. The land inside the caldera is highly fertile, and the Chã do Fogo winery produces very drinkable red and white wines from the fruit and grapes that grow here. 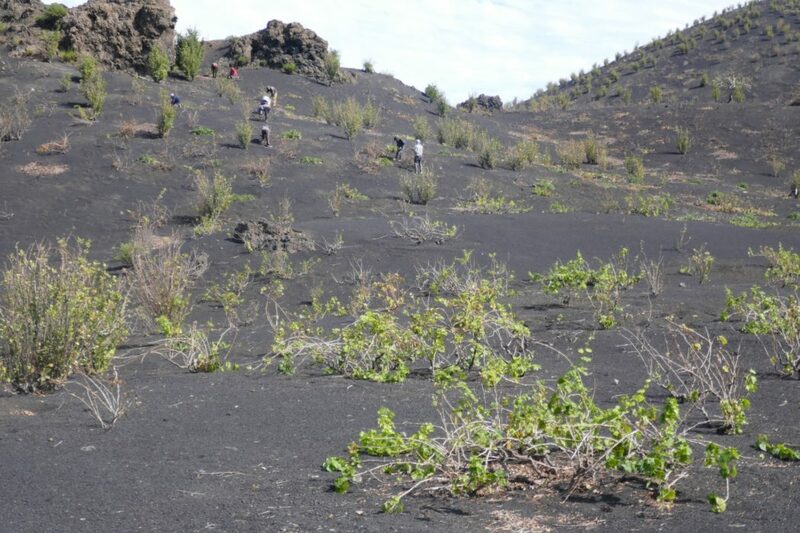 While two villages, Portela and Bangaeira, developed on the crater floor. The volcano is still active, however, erupting about three times per century. It erupted in 1995 and 2014; the latest emitting a lava flow that all but wiped out both villages. 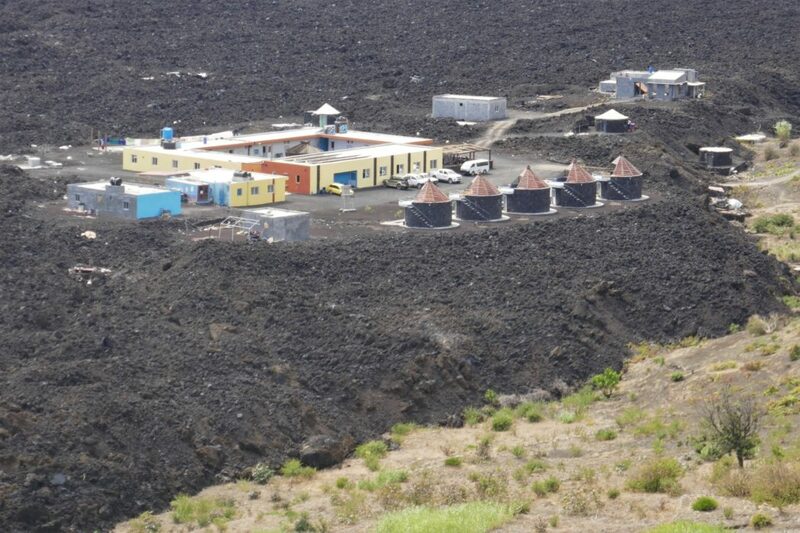 Government and foreign aid provided new homes outside the crater, but many of these now stand empty because as soon as the lava cooled sufficiently, villagers returned and started building homes on the lava. Underfloor heating and a constant supply of hot water guaranteed! All this provides great walking country. 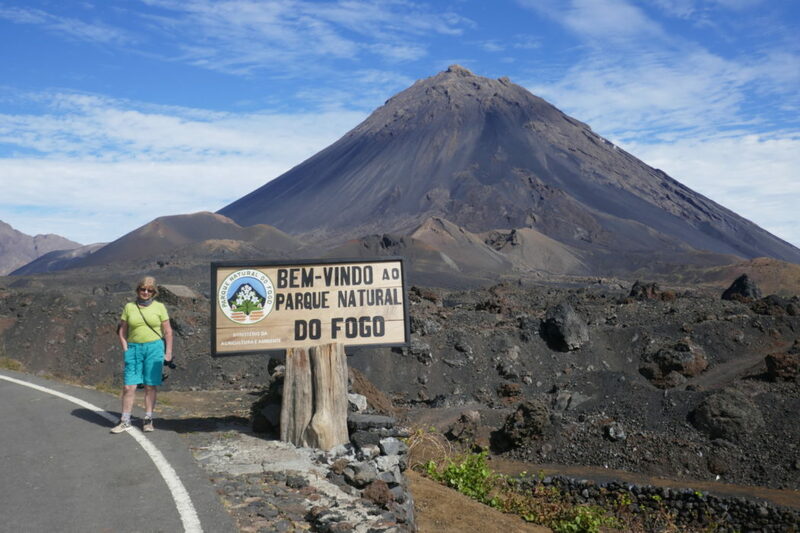 The trek to Pico de Fogo, the summit of the 1785 volcano (2829m above sea level, the highest point in Cape Verde), takes about 4hr. It is steep, but not particularly difficult, although care needs to be taken because of loose rocks and ash pellets. Once on top, a challenging two-hour scramble circles the rim, while a cable-aided section leads to the actual summit. 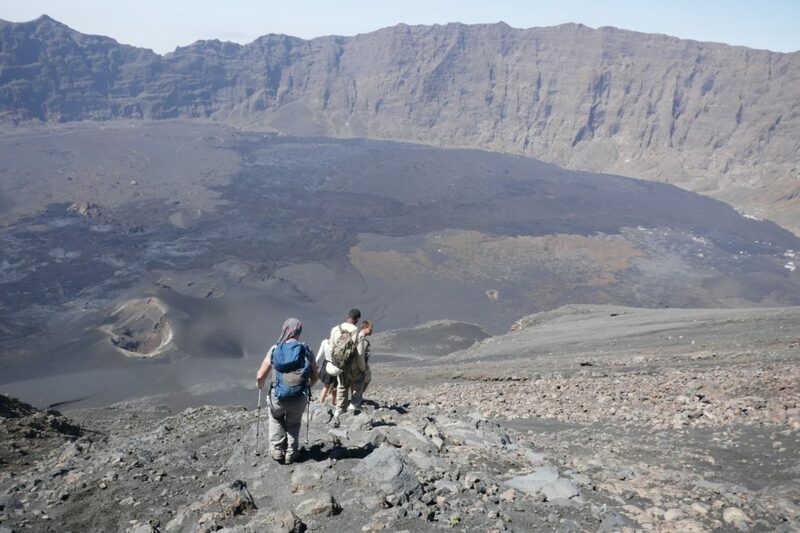 Alternatively, a short drop down into the crater and scramble up the other side connects with an exhilarating scree-run descent on loose ash that takes you 800m down the mountainside in less than 30min. A guide is recommended for this walk as safe route finding is difficult, especially as the first hour is usually undertaken before dawn. Guest houses have opened in the new village to cater for an increasing number of walkers. The largest of these, Casa Marisa, is owned by Mustafa, a German Turk who has organised a collective that controls the prices and quality of local guides. 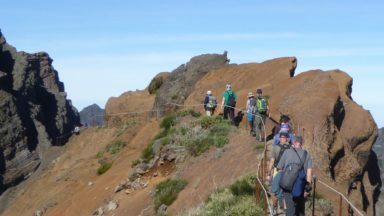 Other guided trips include a section of via ferrata along part of the old caldera wall. 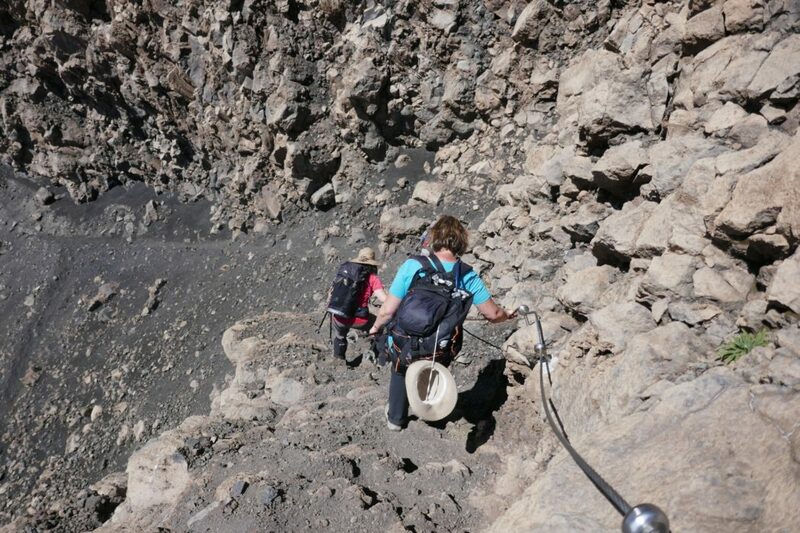 Guides are not necessary for easier walks to the mini-craters of the 1995 and 2014 eruptions. Most visitors arrive by minibus or taxi on a good road from the island capital, São Felipe. Once in the caldera this road disappears beneath the 2014 lava flow, where a replacement rough track connects with new Portela village. 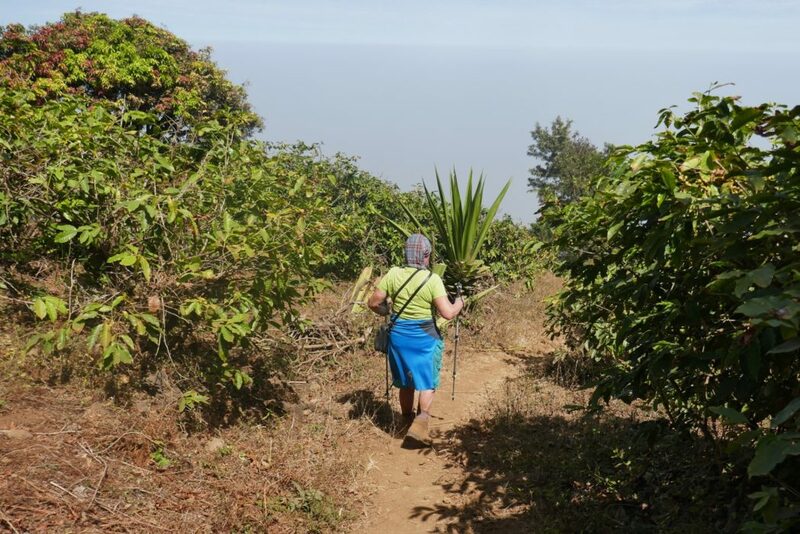 We chose to walk out of the caldera on a track that descends 1800m on the outside of the volcano through fruit orchards and coffee plantations. Near the bottom we reached a roadhead with a stall selling freshly brewed arabica coffee from local beans. Not quite Starbucks, but a welcome respite from a seemingly endless descent. The friendly island of Brava can be reached only by ferry. A hydrofoil connects São Felipe on Fogo with Furna on Brava in less than an hour five times per week. The sea has determined the human history of this island. During the late 19th century, American whaling ships from New Bedford and Providence called here to replenish supplies and take on crew. Once in America, many of the crews stayed permanently and were soon joined by others. 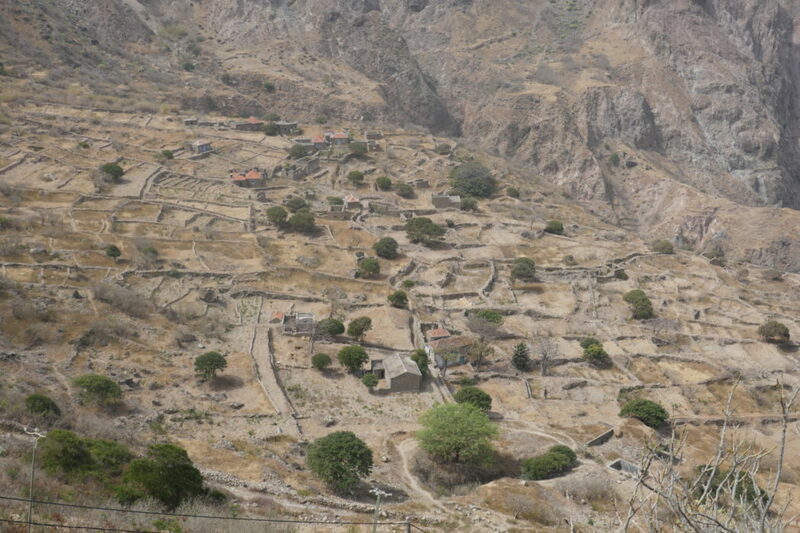 This depopulation has left the once-fertile island with ghost villages and abandoned fields. Brava is a small island of long-dormant volcanoes; indeed, Vila Nova Sintra, the island’s tiny capital, sits in a grassy bowl formed from an old caldera. It is reached from Furna by a new serpentine road, built with Chinese investment, which climbs up and over the caldera rim. 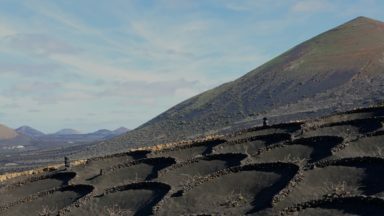 A series of walks (around 3–4hr each) follow ancient cobbled footpaths that lead uphill out of the caldera before dropping down to sea level through remote deserted villages and intricate patchworks of previously cultivated terraces. 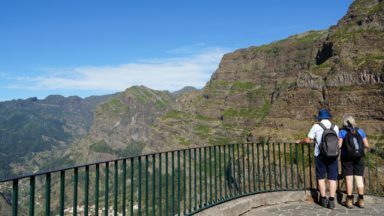 One of these ascends to the island’s high point at Fontainhas (976m), while another descends to the pretty fishing village of Fajã d’Agua in time for a catch-of-the-day lunch and a cold beer overlooking the sea. None of the walks are difficult, although descending 700m on rough cobbles can be very hard on the knees. 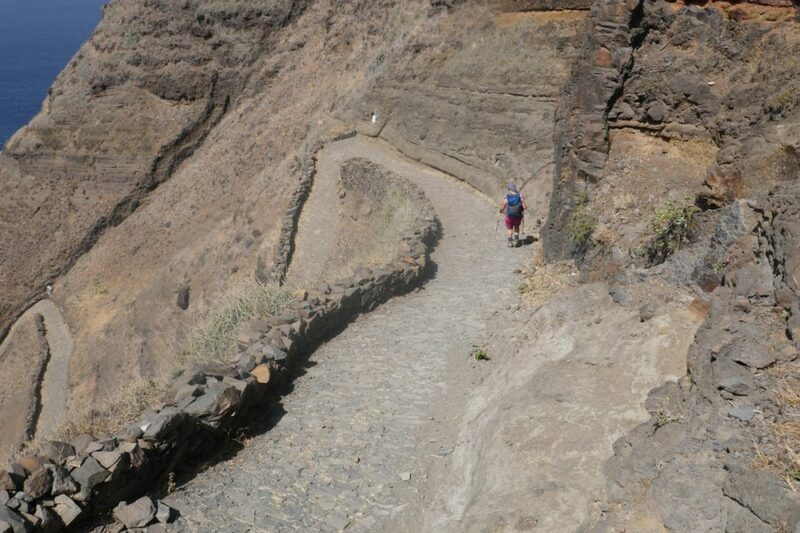 The deep gorges of Santo Antão provide the most spectacular walking in Cape Verde. The island has a high central ridge, dotted with the remains of ancient volcanoes that once poured lava flows down to the ocean in all directions. Over millions of years, heavy rain during the wet season has eroded the ash and softer strata between these flows, leaving a landscape of high rocky ridges and deep gorges, known as ribeiras. 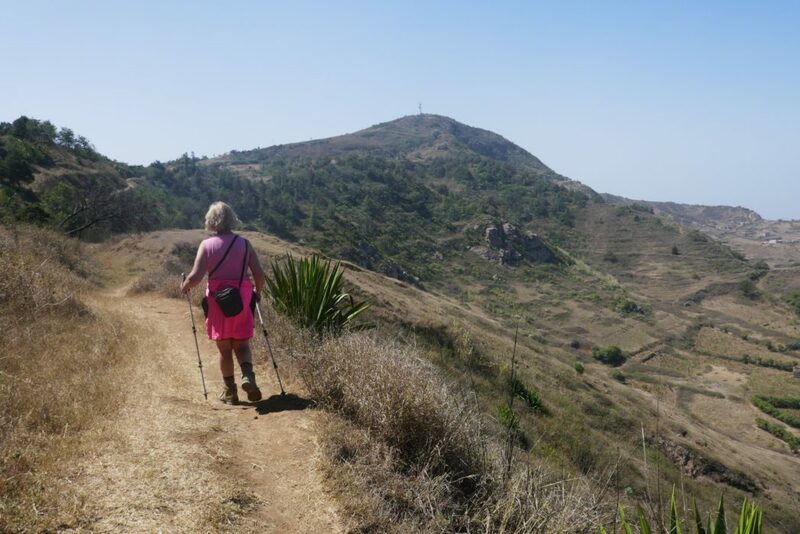 The west of the island is an almost impenetrable landscape of steep walls, jagged ridges and deep ravines that provides very challenging map and compass walking in remote and almost uninhabited surroundings. Forward planning is needed to arrange 4WD transport into the mountains and a local guide to show you the way. Not one for the faint-hearted. The most popular walking area is in the deep ribeiras on the north-east corner of the island. 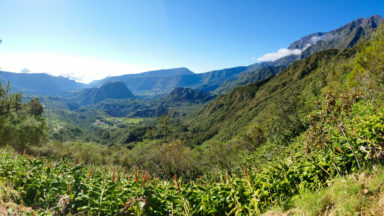 Here, six steep gorges descend approximately 1500m from the central ridge between the Morocos National Park (in the west) and the extinct volcanic crater of Cova de Paul (in the east) to reach the wild Atlantic coast after a 12–15km trek. Two of these valleys have roads running through them and these can be used to access a choice of walking routes. 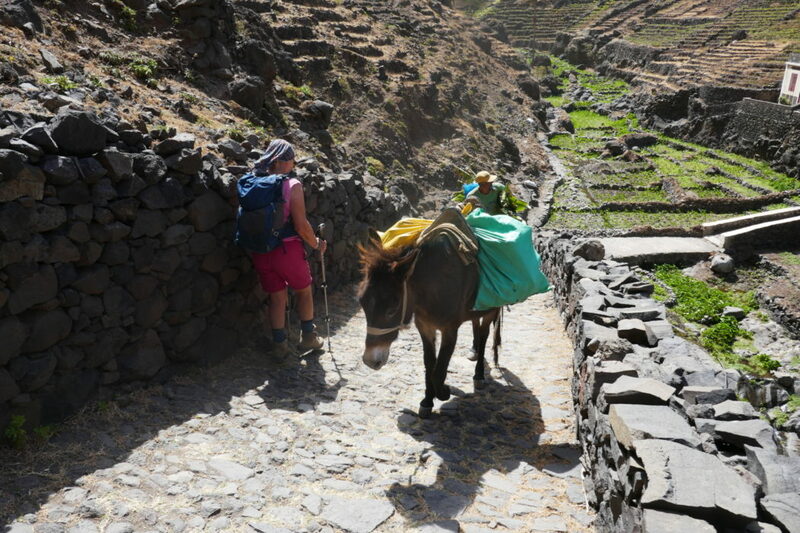 Once off-road, the going is almost entirely on cobbled mule tracks, constructed over the centuries to enable local farmers to access a dizzying series of terraces cut into every available mountainside. Some are still cultivated, but most have been abandoned as drought and population decline have taken their toll. A few hardy souls still farm this mountainous land and, as you walk, you may pass an occasional donkey loaded with harvested crops. Walks tend to follow these trails steeply up and out of one valley before descending equally steeply into the next and following it back to the sea. Most visitors stay in the coastal village of Porta do Sol, which has seen a plethora of small hotels and guesthouses open to cater for walkers. 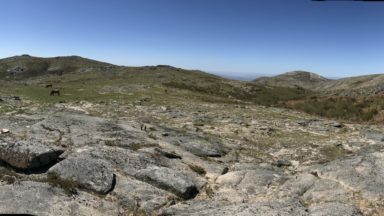 Perhaps the most spectacular walk of all is a five-hour coastal trek west from Porta do Sol to Cruzinha da Garça then inland up the ribeira da Garça to Chã da Igreja, which has a couple of small guesthouses. 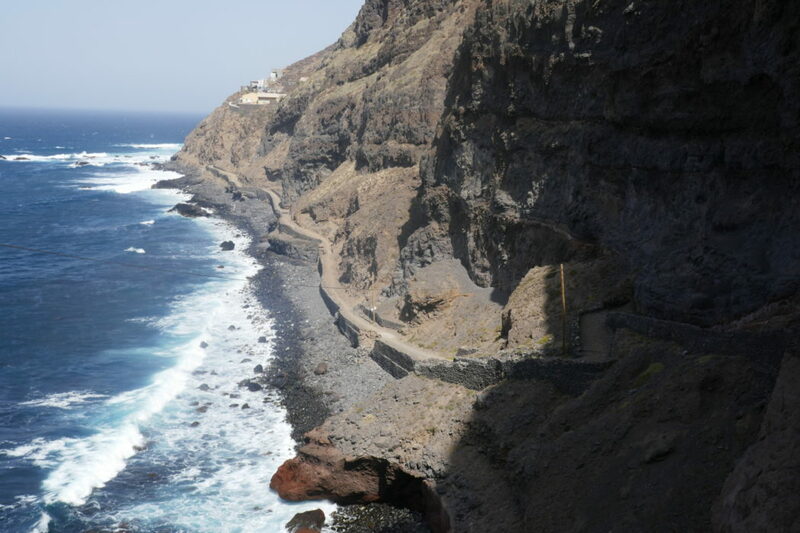 This walk crosses the mouths of three of the ribeiras, then climbs along the side of the sea cliffs that separate them, sometimes cut directly into the soft tufa volcanic rock face. One hour after setting-off, this track reaches Fontainhas village in an unbelievably picturesque location perched on the spine of a low but narrow ridge overlooking a small sea inlet. As you walk, it suddenly appears far below, with a wide, cobbled 4WD track descending steeply ahead. São Vicente is an island of contrasts, a cross between the desert landscape of Sal and the impenetrable mountains of Santo Antão. 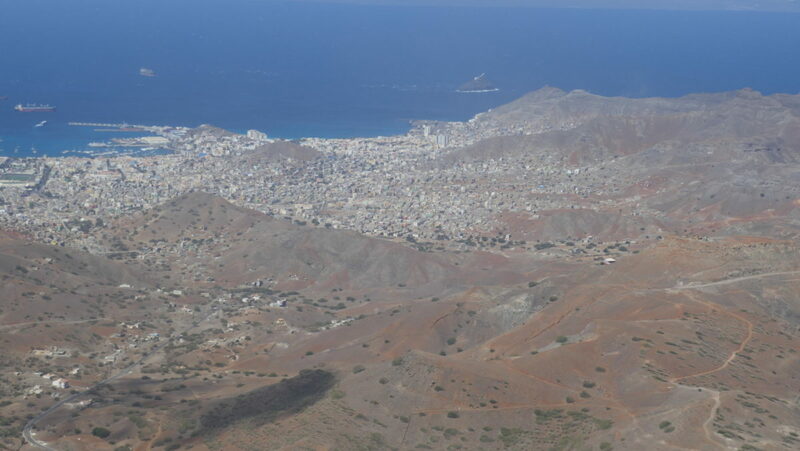 Its capital, Mindelo, is the most vibrant city in the archipelago, with a choice of hotels, restaurants and music venues. It has the best Cape Verdean harbour, which was used by the Royal Navy as a coaling station in the 19th century, and the national university. 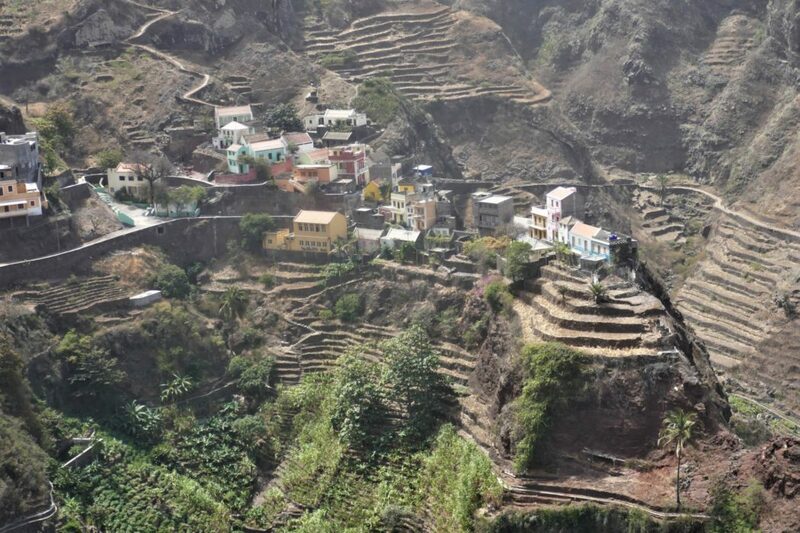 Six kilometres away, Monte Verde rises 750m above a desert landscape providing fine views over the city and across the straights to nearby Santo Antão. The mountain is topped by the antennae of a military communications station, which is served by a road zig-zagging to the summit. This provides the basis for a walking route, partly on the road and partly short-cutting across bare mountainside. 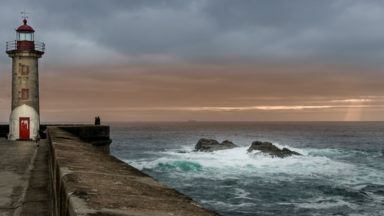 Other walks include a dramatic cliff-side trek on a recently restored cobbled trail to a lighthouse on the most westerly point of the island. 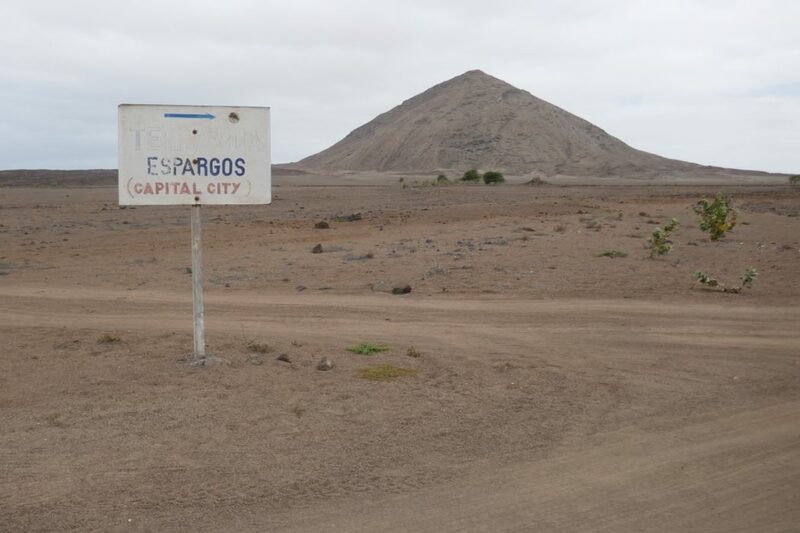 A 10km/2–3hr gently undulating walk beside the longest sand beach in Cape Verde, between Baía das Gatas and Calhau, has been rather spoiled by the opening of a Chinese-funded asphalt road parallel with the path. TAP operate daily flights between Lisbon and airports on Sal, Santiago and São Vicente. These can be booked as part of a through ticket from other European cities (including London). Visas are required for UK and most European citizens. These can be purchased on arrival. Internal flights are operated by Binter: there are 2–3 daily flights between the major islands and 2–3 weekly flights connecting most of the smaller islands. Advance booking is recommended. 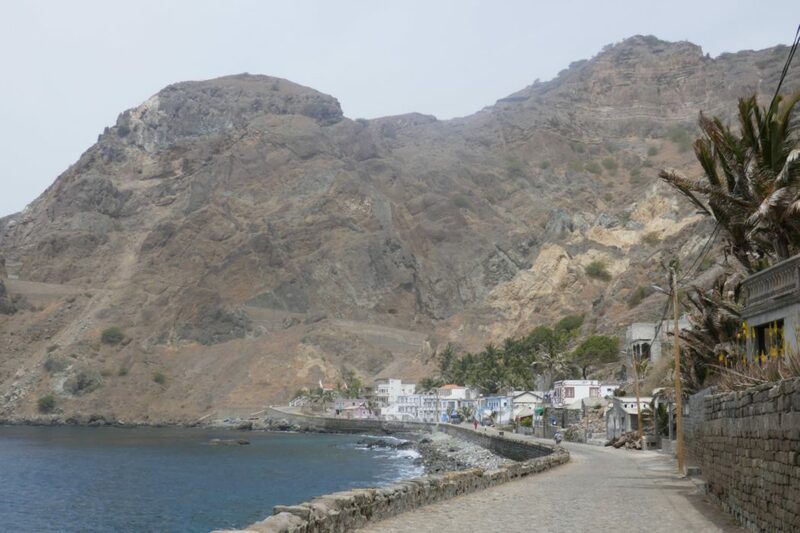 There are no flights to Brava and Santo Antão, which can be reached only by ferry; five times per week from Fogo to Brava and four daily from São Vicente to Santo Antão. The official language is Portuguese, which can be spoken by all Cape Verdeans, and all written communication is in this language. The local Creole language, a sort of pidgin Portuguese spoken by the majority of the population, has no written form. The most commonly spoken foreign language is French, although on Brava, which has strong ties to American emigrants, English is widely spoken. The national currency, the Cape Verdean escudo, has a fixed exchange rate with the Euro of €1 = CVE110. As a result, most businesses will accept Euros or escudos. The escudo is non-convertible and cannot be obtained outside the islands. Every town has an ATM where cash can be drawn on foreign debit cards. There are plenty of places to stay, including hotels and guest houses. Restaurants open until late and dinner can usually be found until about 10pm, even on the smaller islands. The cost of living is substantially cheaper than in Europe. Bradt publish the best English language guidebook (ISBN 9781784770501). The best overall map of the islands (at 1:80,000) is produced by Freytag & Berndt. AB Kartenverlag produce a series of 1:50,000 walking maps of each island.